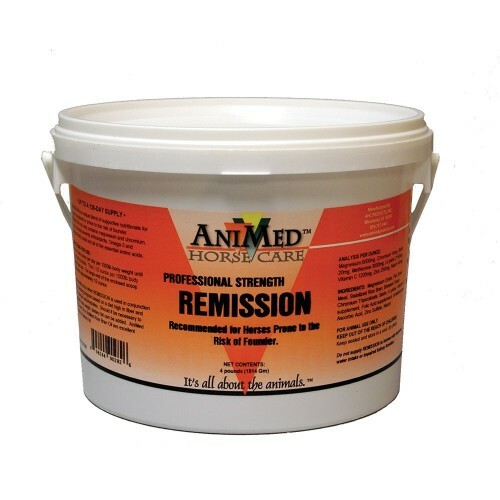 AniMed Remission is a scientific blend of natural supportive ingredients with probiotics, functional carbohydrates (2nd generation prebiotic), and omega 3 fatty acids. Saccharomyces cerevisiae to support hindgut function by stimulating the natural beneficial bacteria to aid fiber digestibility. Phosphorus and calcium for uptake (bone development) and hoof condition. Lacto-Mos™ to support the beneficial bacteria in the stomach to maintain natural gut health and integrity. Bio-Mos, a functional carbohydrate (2nd generation prebiotic) that is a unique sugar which can help the low glycemic and low insulin response in foods. 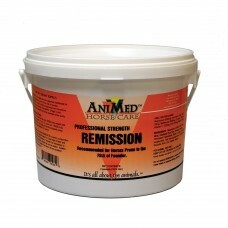 Most important, Bio-Mos binds to the disease-causing, gram-negative bacteria (out with the bad bugs) in the horse’s gut and carries them harmlessly out through the feces. 70 antioxidants, Omega 3 and 6 fatty acids, and all of the other essential amino acids.